Previous studies demonstrated that the N15 protelomerase TelN relies on the telRL repeats for efficient binding. To define the binding site on telRL, DNase I footprint analyses were carried out using the TelNY424F protein (Deneke et al. 2002). The footprints exhibited a large stretch of approximately 50 nucleotides on both DNA strands protected against nuclease attack. 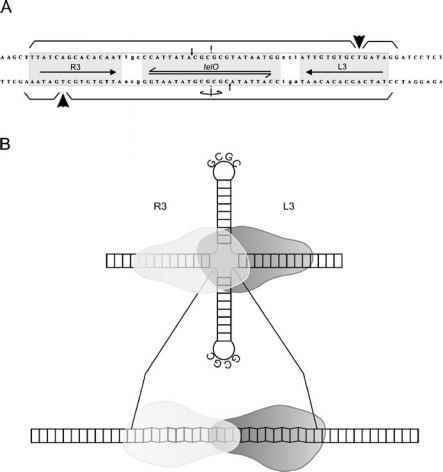 The stretches comprise telO and adjacent sequences including one arm of the L3/R3 repeat (Fig. 7a). On each strand, one hypersensitive band could be detected. The hypersensitive bands reveal a mirror symmetric arrangement and separate two protected regions of 52 and 6 bp which together cover telRL (Fig. 7a). Surface plasmon resonance showed that TelN is monomeric in solution. In the presence of telRL, 1.64 TelN molecules per telRL target were determined, which allows the conclusion that two TelN molecules are bound to each telRL site. Huang and co-workers investigated the subunit structure of TelN and TelK by equilibrium ultracentrifugation (Huang et al. 2004). Both proteins are monomers in solution. The number of molecules needed to interact with the substrate was determined by the use of telRL duplex oligonucleotides as targets. To distinguish the left half of telRL from the right, the oligonu-cleotides had an extension of ten nucleotides at the L3 side (Fig. 8). When a nick was placed on the top strand at the centre of dyad symmetry between nucleotides 28 and 29, TelN could not process this suicide substrate and caused an accumulation of two DNA-protein complexes that could be separated on polyacrylamide gels. Upon 32 P labelling of the top left end of the suicide substrate and treatment with TelN, the autoradiogram showed the faster migrating protein-oligonucleotide complex, which contained the 28-bp (R3) side of telRL. Labelling of the bottom right end of the suicide substrate gave a slower migrating complex comprising TelN and the extended 38-bp L3 side of telRL. Each half of the dyad symmetrical target site thus provides a binding (and processing) site for each molecule of the protelomerase. 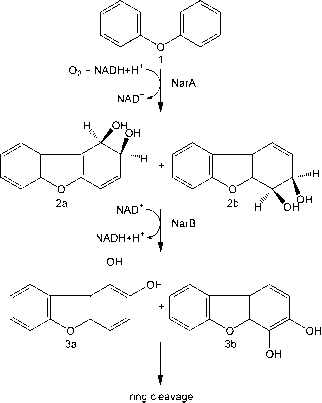 Which nucleotides of telRL in addition to the L3/R3 repeat are essential for TelN binding? To answer this question Deneke et al. (2002) introduced mutations within telO and examined the stability of the telRL/TelN complexes. A target mutation leading to an asymmetric sequence situation in telO resulted in less stable complex formation (Fig. 8). Restoring symmetry by introduction of a second mutation further destabilized the complexes. This already indicates that sequences within telO are also important for TelN binding. Substrates containing mutations in which part of the core sequence was replaced by a random symmetric sequence, or in which the central (CG)3 was extended to a symmetric (CG)7 by replacement of the flanking TATA region, behaved inertly in binding (Fig. 8). On the other hand, the replacement of the central (CG)3 by TATATA yielding (TA)7 retained full binding capacity. Consequently, it can be presumed that the sequences flanking the central 6-bp segment of telO but not the segment itself are important for complex formation.